Looking for good eats? Then look no further. 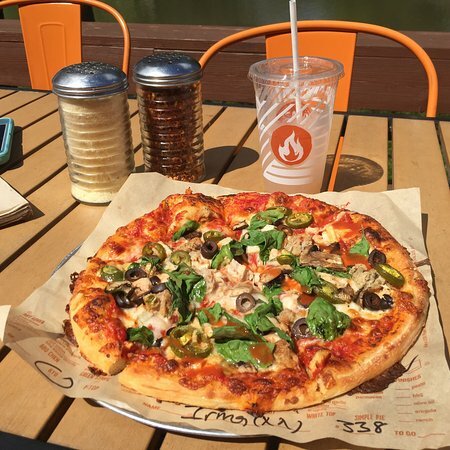 There’s a restaurant called Blaze Pizza, where pizzas are being made right in front of your eyes. The pizzas are 11 inches (personal size). There’s different type of pizzas you can choose from; a signature (pre made) or a pizza you can build yourself. Prices are reasonable – the most you would spend is about $8. The flavor is different than any other pizza I have tasted. Let’s start with the sauces… classic, spicy, white and even pesto. They also have different cheeses – six to choose from and of course for the dairy free and lactaid free. For the vegans, there is vegan cheese. There’s only pork as meat but they have chicken and turkey for those who despise the pork. All the veggies are common expected for like four or five. Let’s not forget that they have dessert; Chocolate chip cookies, S’more pies and brownies for just $2.! When they finish making the pizza, there’s this huge oven that they gently put your pizza in for it to cook. There’s also a patio to sit outside and high bistro chairs to sit on. It’s a groovy place to eat in. Insight and personal view point..